First some history. We both used to work for, and met each other at Evans Cycles, Liverpool. 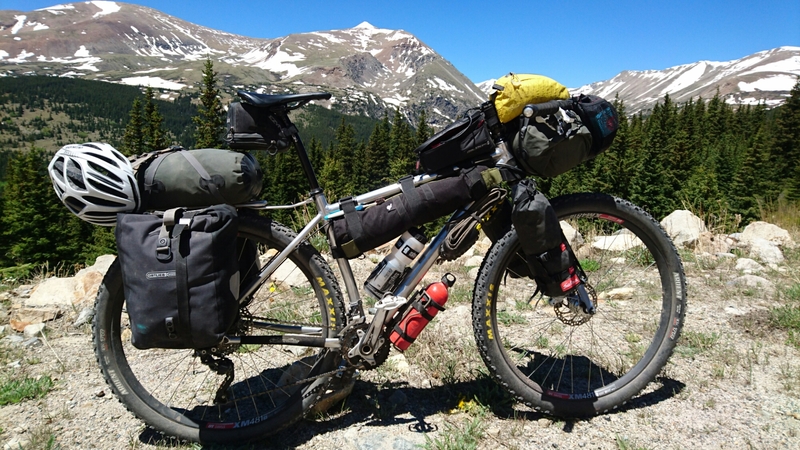 I had worked for them since 2007 and having seen their Pinnacle range of bikes develop under James Olsen, who came fifth in the 2013 Tour Divide, I purchased a Ramin, their 29er hardtail model. 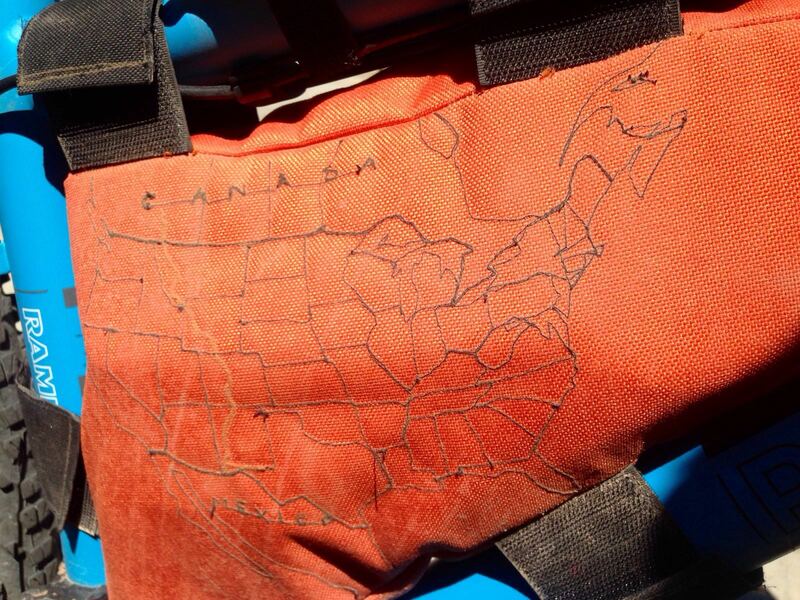 This served me well for a couple of years as a general XC bike, and when we decided to do our own trip, I started looking around at other options for a bike packing machine. After considering bikes from the usual suspects, Salsa, Surly, and Genesis I decided that the geometry of the Ramin fitted me better than anything else, and it could be adapted for the ride. The traditional material for a touring bike has always been steel, partly for its ride characteristics, and also it’s ability to be repaired in the back of beyond by anyone with a welding torch. I’ve been a bit sceptical of these benefits with the advent of wider rims and tyres adding comfort to aluminium frames, and the rarity of the occasion where you might need a field repair. My Ramin frame, stripped and polished weighs in at about 1.7kg, half a kilo lighter than most of the steel options, plus it has rack mounts and geometry with a relatively short top tube (by recent standards) which works well with the Jones bars that we’re using. It’s worth noting that these bikes are not expensive, starting at £500 complete, and I saw no reason to spend more money. So my frame is an XL, Magda ended up getting the same but in Small. We got hold of Singular Rooster forks, kindly supplied by Sam at Singular Cycles, as these had the triple cage mounts to fit extra bags at the front. We chose rigid forks after reading various reports that suspension is unnecessary, and after 1000 miles, I believe we made the right choice. 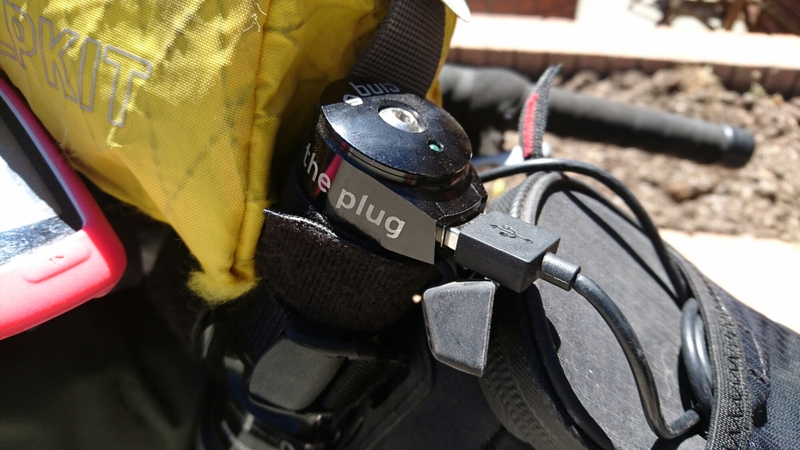 The majority of the riding just isn’t that rough, it’s one less thing to go wrong, and enables us to carry more gear. 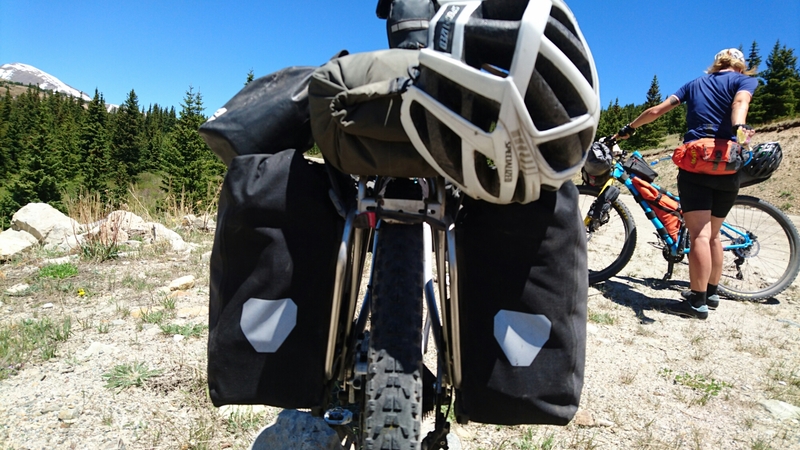 The next big thing we bought was Jones H Bars, we had read a lot about the benefits of a 45 degree sweep, and I liked the idea of carrying a bag underneath easily. We visited Keep Pedalling in Manchester, and following Shona’s excellent advice we purchased a set each. Shona also arranged a next day delivery on the day of our flight, for some Salsa Anything Cages to fit the forks. The bars, and the cages, have been spot on and I wouldn’t want anything else! 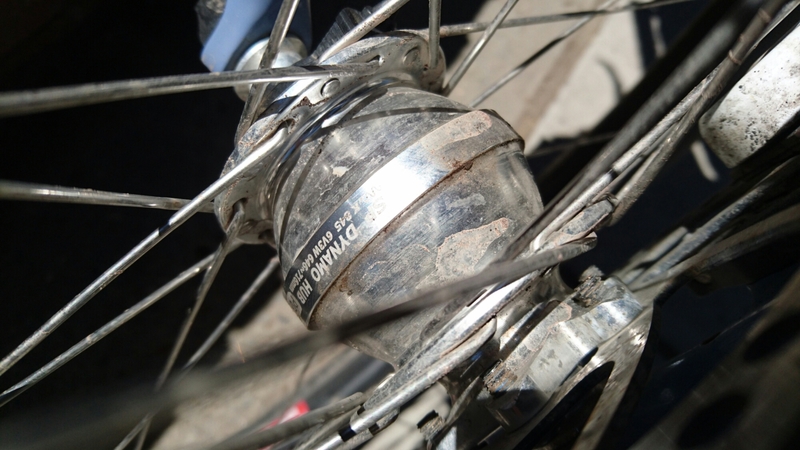 The rest of the kit is a bit of a mix, we’re both running 2×10 Shimano, reliable and easy to source spares. Maxxis Ardent Tyres, 2.4 front 2.25 rear, which have been a good compromise on rolling resistance and grip. We’re set up tubeless which after a slight issue on day 2, has been faultless since. I’ve got nice wide DT481 rims which allows a lower pressure and wider tyre profile, definitely a benefit on the washboard roads, but Magda is running the stock Alex/Shimano wheelset without issue. Other parts are probably not that significant, other than we both used tried and tested Specialized Saddles. Moving onto our luggage, it’s a bit of a mix! First off, Magda is incredibly talented with a sewing machine, and made custom bags for both our frames. Hers covers the whole triangle, whilst mine just the top half, leaving room for a litre water bottle below. My frame bag contains our tent. A Vaude Taurus Ultralight, which allthough could be a bit more spacious, it’s light, easy to put up, and I can’t really fault it. Up front I’ve got the Salsa Anything HD Cages and bags on my forks, containing my sleeping mat in one (Thermarest Prolite) and Primaloft / Goretex Proshell jackets in the other. 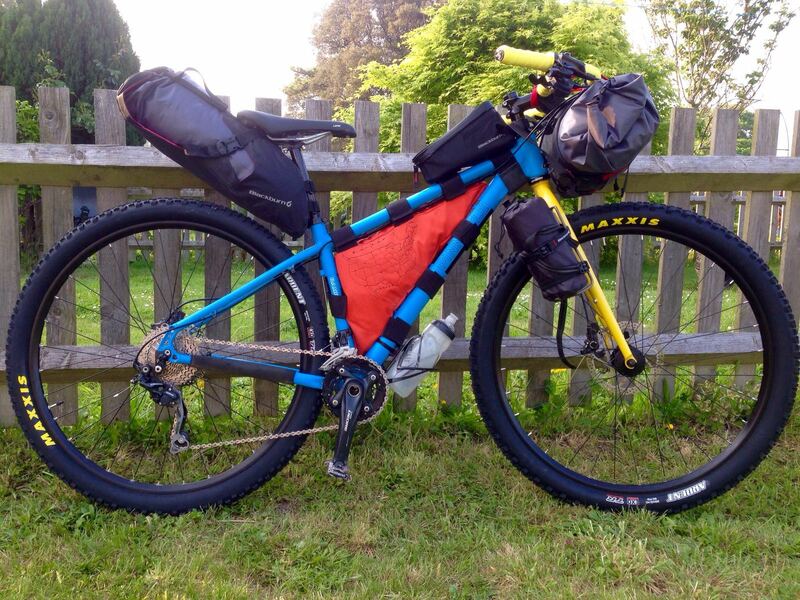 Again I can’t fault any of this gear, the Salsa bags are rock solid and the kit inside has proved invaluable. under the bars is an Alpkit Xtra 13l drybag, which fits the Jones bars and my sleeping bag perfectly. Both our sleeping bags are Rab Ascent 500s, which have been fine from 40 degree desert heat, to frosty mornings in Colorado. 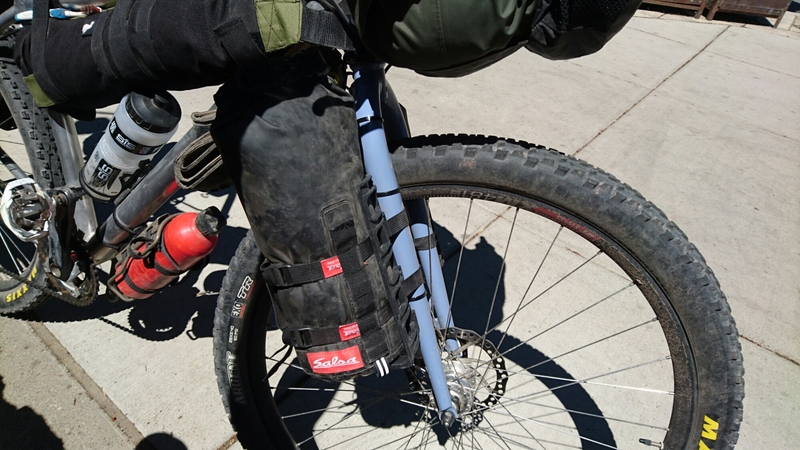 We both also have Blackburn Outpost top tube bags, which are great for your phone/wallet/multitool etc, and again, are rock solid. Outback I have a Tortec Epic stainless steel rack, looks similar to a Tubus but half the price. 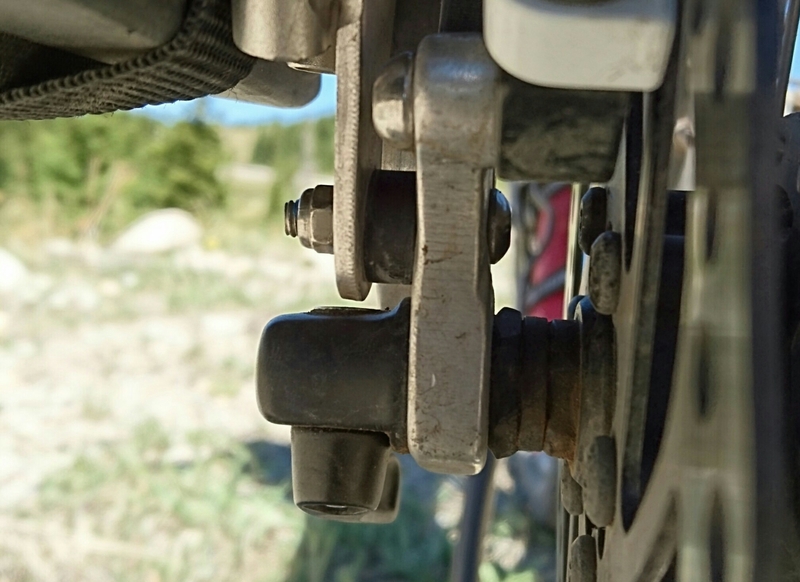 Rather than using the disk brake adaptors I spaced it out myself, and also ran button head bolts from the inside of the dropouts with nylock nuts to secure, so it would be easier to remove a broken bolt. On the rack I have another 13l Alpkit bag containing my clothes, and 2 x Ortlieb front roller panniers providing storage for the stove, food, spares etc. The stove itself is an MSR Dragonfly, which runs on unleaded petrol/gas at a cost of around 50cents every 2 weeks! 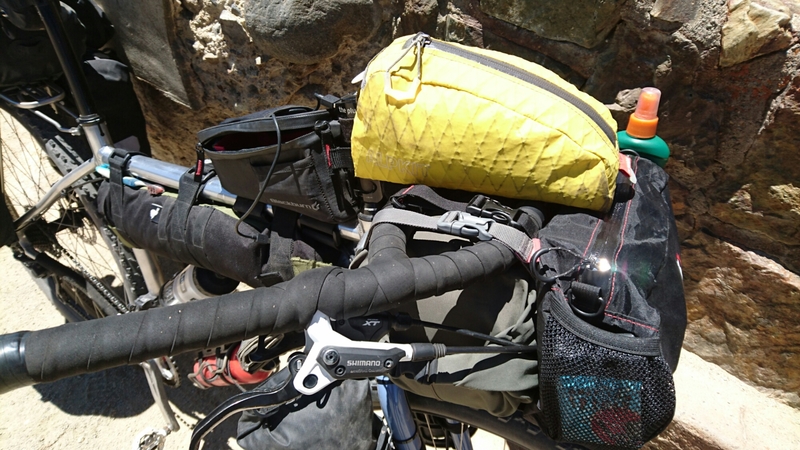 Magda is using a Blackburn Outpost seat pack and handlebar roll, which she has been happy with, particularly the capacity of the bar roll. She also uses a Camelback Palos hydration pack, which fits round the hips rather than over the shoulders. This give extra water capacity and space for extra food and spares. Couple of other things worth mentioning is my phone – a Sony Xperia Z5, which allthough not without its faults, is waterproof, takes a normal SD card to transfer files easily, has an excellent camera, and makes me wonder whether bringing another camera was worth it. 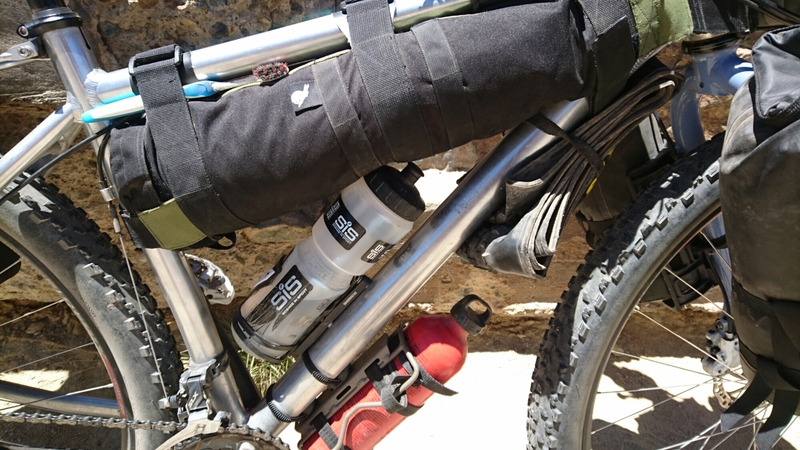 We also use 3 x 4l MSR Dromedary water bags, and an MSR filter for those times we need extra fluids. So that’s about it… If anyone has any questions feel free to comment but we’re both happy with our setups despite the lack of practice beforehand. All the gear and every idea. My mind boggles.